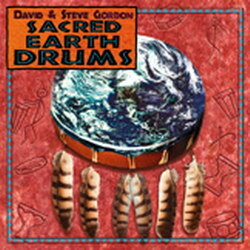 SACRED EARTH DRUMS features an irresistable blend of powerful beats, tribal melodies and nature sounds, combined to form an exciting new kind of percussion music. Percussionists Steve and David Gordon use their handheld and large ceremonial drums, medicine rattles, Native American flutes, Incan pan pipes, rainsticks, natural sounds and studio wizardry, to take the listener on a healing Shamanic journey. Along the way, they will receive a message of reverence for the Earth and the sacredness of life. So hear the call of the drum, move your body and become absorbed in the dance of life!